By using a service design approach, it is possible to create superior customer experiences with the ultimate goal of accelerating growth and sustainably improving business performance. In this article, we share two examples of how service design was used to improve agility in two traditional organisations, and the impact the changed approach had on their business. May we present: Cases Tekes and Bank of Ireland. In 2015-2016, Hellon was involved in a project with the objective of establishing a more customer centric culture and improving customer experience at Tekes (currently part of Business Finland). As a part of Business Finland, Tekes general mission is to support Finnish exports and offer expert advice, funding, and networking opportunities for entrepreneurial companies aiming to grow internationally. The challenge Tekes was seeking solutions for, was that customers found most of their services confusing, difficult to understand and, above all, tailored to the needs of the organisation rather than its customers. Long-term clients had needed to learn to navigate the bureaucratic and perplexing nature of the services. New clients, on the other hand, became frustrated with the complexity right from the start, and some services even required external help (e.g. funding applications). In Bank of Ireland’s case, the challenge was that their customer base had grown out of the bank’s traditional way of thinking and working. Customers perceived e.g. the booking, identification, and verification processes to be unnecessarily complex, and the 234-year old bank was becoming detached from their clients’ needs. Hellon was brought in to help involve management in the customer-centric service design process, and to guide them on the ways service design can affect their ability to achieve key business goals. In the Spring of 2016, we launched the “Bank of Ireland Experience Design” service design programme, in which 36 management level employees participated for the duration of 8 months. As a result of the insightful programme, Bank of Ireland simplified their processes, changed their way of thinking, and evolved from a purely business-oriented financial institution, to a truly customer-centric modern bank. Tekes recognised the need for service design through practical means. A year prior to commencing the service design journey with Hellon, Tekes had systematically began to productise their service offering. Through this process, Tekes was aiming to become more cost-effective, and to improve targeting of the services. There was also a need to make the services easier for customers to understand and adopt. As the process progressed it became apparent, however, that a much larger organization-wide transformation was taking place, and Tekes needed help. This way of recognising the need for service design is very typical: a concrete goal, which starts off as a drop in the ocean, can at its best lead to an innovative and collaborative way of working throughout the organisation. The customer-centric way of thinking was brought into every level of Tekes’ operations. Together, Hellon and Tekes began to clarify the customer point of view, and what their expectations were with regards to Tekes’ customer experience and service offering. During 2015, multiple agile pilots, exercises and events were organised, in which employees from various parts of the organisation were involved in developing better services in a collaborative way. Simultaneously, the foundations of a customer-centric corporate culture were built. Bank of Ireland faced the challenge of having old-fashioned systems and complex processes, which did not fit the changing customer needs. These included customer identification and verification, as well as daily tasks related to transactions and meeting booking. In other words. In order to get with the times, the bank wanted to simplify their processes and become more customer centric. Our approach to the challenge was launching a “Bank of Ireland Experience Design” service design program, in which 36 management level employees participated during an 8-month period. The programme consisted of workshops, mentoring, and group exercises, which delved deeper into the bank’s existing, real customer experience challenges. Through the programme, Bank of Ireland began to understand their current state and their customers better, which is the starting point for using service design for long-term transformation. By introducing a systemic and customer-centric service design approach, Bank of Ireland management were given tools for setting customer-centric business goals and building an organizational structure supporting those goals. A great example of how service design was implemented during the Bank of Ireland Experience Design programme relates to a very important customer group; people who are dealing with the loss of a loved one, and sorting out their last will and testament. The customer journey for these customers was disjointed and required multiple points of contact, which in an already emotional situation resulted in a lot of frustration. Additionally, the loyalty and long-term commitment to the bank of the deceased person and their family was barely considered in this situation. By means of design, a new process stripped off unnecessary and alienating elements such as superfluous identification was created, introducing an increasingly personal customer service concept. The end result was a more effective service which enabled a strong and positive emotional connection with the customers. Through the use of service design, both Tekes and Bank of Ireland re-assessed their operations, and streamlined processes which had become obsolete from a customer experience perspective. For both organisations, the business impact was a significantly improved customer satisfaction score and more efficient processes. A new service/ customer experience vision and service promise was created for Tekes, along with the introduction of processes for more agile planning and implementation of their services. Results were to be achieved on all three organisational levels: service level, systems level, and strategic level. The impact of the collaboration between Hellon and Tekes was measured by the following KPIs: impact on customer experience, organisation-wide employee experience, and customer loyalty. Bank of Ireland, on the other hand, embraced service design as a strategic tool, and set up a new Design Thinking department which is mandated to work comprehensively across all departments. The bank succeeded in increasing their NPS score by 3 units within two months of the programme ending. 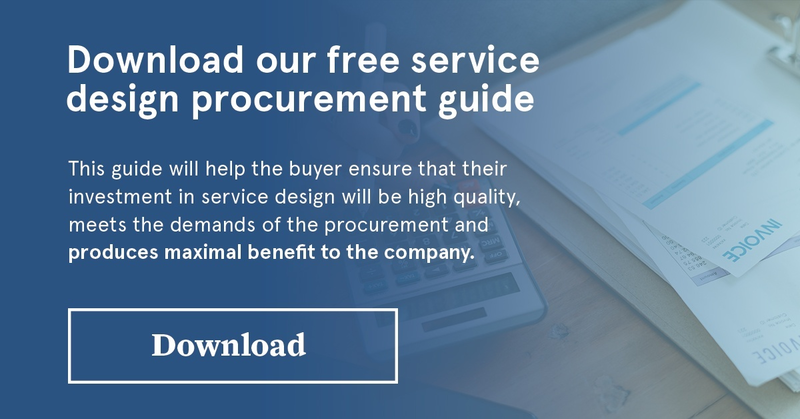 Read more about what to keep in mind when embarking on a service design journey and selecting a partner in our Service Design Procurement Guide. In October 2018, Hellon received the “Best in Commercial Category” award at the Service Design Global Conference in Dublin. This was Hellon’s third award at the event making us the most-awarded agency by the Service Design Network. The awarded project was conducted together with Irish grocery retail and wholesale company Musgrave, and was based around designing an improved experience for parents shopping for groceries with small children in order to attract and support the segment. The business impact of the project was estimated to be an annual incremental revenue increase of approximately €5 million through increased sales and footfall. Hellon’s client, Musgrave, had identified an ongoing price war within the parental shopping segment in Ireland, which had resulted in a competitive race on price in baby products. In some cases, products were sold at or even below cost. Musgrave is founded on its strong values and are known for their high-quality products, great service and strong local community engagement. Staying true to the company brand, the objective of the service design project was to identify ways to compete in the baby aisles without being drawn into the price war with the competitors. In addition to increasing footfall and driving spend holistically, the aim was to drive significant revenue growth in this specific shopper segment both in the baby category and throughout the stores, by offering a superior parent shopper experience. Over four months, we co-created a compelling value proposition for parent shoppers, that not only offers a competitive in-store customer experience but also meets and exceeds our client’s business objectives. The project process was based on the Design Council’s Double Diamond model, with an emphasis on human-centric design and co-creation. A total of 45 customers were engaged throughout the process, along with a variety of important Musgrave stakeholders. Starting with a 4-week Insight phase, we followed ethnographic research methodologies to gather qualitative data from customers, through design probes and semi-structured interviews. After analysing the design probe results, 8 out of 12 customers were chosen to take part in more in-depth interviews, to dive deeper into the experiences of parent shoppers. The customers chosen for this phase were chosen to represent a variety of different needs and life situations. Some were more concerned about finding the best quality food for their child, whereas others struggled with the shopping trip itself. The data was then analysed, creating in-depth understanding of the needs and challenges of parent shoppers. Among the identified challenges was the checkout, where parents had to juggle packing, paying, and managing their child who was often distracted by the placement of impulse purchase items. All customers reported feelings of fear around whether their child’s behaviour would impact their ability to focus on doing their shop. All respondents also spoke of an aversion to branded baby foods, and a preference for blending up their own meals. From the analysis, 40 opportunity areas regarding how Musgrave might better support stressed-out parent shoppers were identified. The Insight phase was followed by Co-creation and Concept Design, in which improvement ideas for a competitive parent shopper experience were co-created. Together with the Musgrave, we arranged 2 co-creation workshops with the objective of creating solutions and ideas for the identified opportunity areas. We then prioritised the most potential ideas together based on stakeholder interest, potential impact and concept value to the customer (is it functional, experiential, or emotional). A selection of 24 prioritised ideas were refined and designed in detail as a result of the co-creation workshops. The ideas then formed a total of 1 concept including 10 different prototypes proposed for the following phase. The process finally culminated with Prototyping and Validation, during which the selected parent shopping concept was tested in a LiveLab in-store with real customers. Together with the Musgrave, we decided to focus on testing an experience that makes parents’ life easier, influencing where to do their “big shop”, giving them more head space to respond to offers and new products in the store. The ideas were refined into the Parent VIP Hour concept, a time of the day/week when parents of young children know they can receive preferential treatment in-store, including Flexible Parent Parking, Parent-Friendly checkouts, and Assistance from Till to Car. The Parent VIP Hour concept was tested in two stores, engaging a total of 33 customers, all of whom were interviewed after testing the new shopping experience. Feedback was gathered from both customers and store staff to evaluate and validate the impact of the improved experience. The LiveLab results validated the potential to impact revenue and footfall by reducing stress for parent shoppers. From the Parent VIP Hour prototype, we recorded an almost 50% drop in reported parent shopper stress levels when shopping with kids. There was also indication of increase in spend (18%) and reported likelihood of increased visits (16%). The LiveLab participants reported being on average 90% likely to recommend the VIP Hour and 3 out of 10 ideas scored 92% or more for participant enthusiasm. Those ideas were Extra Parent Parking, Free Fruit for Kids and Parent Treat (free coffee). The Parent Checkout, in which selected checkouts were cleared of sweets and there was support for packing, was reported as the 2nd highest influencer on shopping decision and was met with great enthusiasm. During the project, we saw an increase of 643% in social media reach and 512% in social media engagement. For the stores involved in the service design project and in the commercial trial, the total annual incremental revenue impact was as high as 678,000€. The service design project outcomes fed into Musgrave’s 3-year plan in terms of opportunities and new routes to market for this segment. Based on the project, the improved customer experience and the new solutions, an incremental revenue of €4.84 million annually is expected to be achieved as a direct result of the work. For the client organisation, the project was the first to use qualitative research methods to deliver in-depth insight on a critically important segment for the business. Previously, the organisation relied solely on quantitative research in guiding development efforts. The project proved that smaller qualitative samples can give robust insight that is more suitable for identifying how to improve or design new services. The insight also unearthed new opportunity areas for the client that weren’t originally in their scope of development. Through the ideation techniques, journey mapping and prioritisation of the most impactful elements, the end propositions developed were of a high quality and managed to effectively deliver solutions in a traditionally siloed organization. Musgrave valued the real feedback from consumers during the prototyping phase, which allowed them to go to market with a final service that worked right from the start. The project kick-started a shift towards customer-centric development within the organisation. By being engaged and gathering insights, Musgrave stakeholders got closer to their customers and developed more empathy towards their needs and challenges, making them aware that grocery shopping is an end to end experience. Due to the nature of the service design approach, the company saw a breaking down of silos – the cross-functional team set up for the project worked extremely well together and provided a great outcome and learning experience. This project is a prime example of a successful Service Design project that had a positive impact on various levels. It provided Musgrave with valuable insights, an improved and competitive parent shopping experience and also managed to shake up internal processes, driving a shift towards customer-centric development. The prototyped concept validated the desirability of the Parent VIP Hour, and allowed Musgrave to implement the new shopping experience with confidence that it will work from day 1, and supported in proving the ROI. Parent VIP Hour is now being rolled out to 50 stores during the year (2018), Free Fruit for kids is now nationwide and all new stores have been fitted with hotel grade changing rooms and doubled family parking spaces. The results of the Parent VIP Hour are a great example of proving the ROI of Service Design. Through service design, we were able to not only reduce the stress of parent shoppers and make their everyday better, but also create a competitive customer experience resulting in increased spend and a substantial increase in revenue. Hellon has secured a funding of almost half a million euro to teach their Artificial Intelligence AINO to understand and recognize what makes us happy – the technology is expected to revolutionize the customer services industry first in Finland and then around the world. We have developed our own AINO artificial intelligence solution since 2016. With the funding from Business Finland, we will begin to develop a unique artificial intelligence technology for understanding speech, whose goal is to support large organizations to engage in better dialogue with their customers. Global players in the intelligence field such as Google, Amazon and Baidu are currently focusing only on the world’s largest markets, such as English, Chinese, or Spanish. At Hellon, we want to develop our technology specifically for those areas whose language is not among the 20 most spoken languages in the world. Market size will not be an issue for us, as more than 2 billion people still remain once we exclude the world’s 20 most talked-about languages. Taneli Tikka, Chairman of the Technology Industries of Finland´s AI Group, is convinced of our solution: “From the point of view of artificial intelligence development in Finland, it is strategically important to develop the understanding of artificial intelligence in Finnish, as the international big companies do not prioritize it. Hellon is a good example of a company that has seen the possibilities of artificial intelligence and has begun to build it in the context of its own business. Hellon’s funding is part of Business Finland’s AI Business program, which was launched at the beginning of this year. The aim of the program is to raise Finland as the best place in the world to develop and utilize artificial intelligence. According to estimates, artificial intelligence and the platform industry account for 30 percent of Finland’s gross domestic product in 2030. Business Finland is tasked with sharing the risk of developing radical innovations and opening doors to selling them on the global market. AI Business Program Manager Outi Keski-Äijö sees the understanding of artificial intelligence in Finnish as a strategic priority, so that Finnish society and businesses won’t be left behind in using artificial intelligence. “According to our report, artificial intelligence that understands Finnish language is not developed by global artificial intelligence giants, instead we need to research and develop it with Finnish companies such as Hellon,” says Outi Keski-Äijö. Our goal is that the artificial intelligence learns by itself how to distinguish the key attributes of people in the spoken language, such as emotions, weightings, tone of voice, or the way we talk. “We are infinitely interested in what makes people happy,” says Niko Reunanen, Hellon’s leading data scientist. “With our AINO artificial intelligence, we have already found new ways to understand, model and even predict happiness and customer satisfaction. With AINO, we have at our hand a unique project on a global scale. If our artificial intelligence manages to recognize the spoken language and experiences of a spoken speech in a rare language like Finnish, our solution can be scaled to any of the other world’s languages. We are also arguing that the solution will in the future be of significant help to, for example, global customer and telephone services or can could be used to even improve the functioning of emergency centres.